This was my first time attending this conference, and Day 1 was an amazing experience. At this point last year, I literally didn’t know that there was a term (“sports analytics”) for the stuff I liked to do in my spare time. Now I learn that there is not only an entire industry built up around the practice, but a whole army of nerds in its society. Naturally, I have tons of criticisms of various things that I saw and heard—that’s what I do—but I loved it, even the parts I hated. Featuring Malcolm Gladwell (Author of Outliers), Jeff Van Gundy (ESPN), and others I didn’t recognize. The blue dots (left axis) are simply Hard Work plotted against Talent. 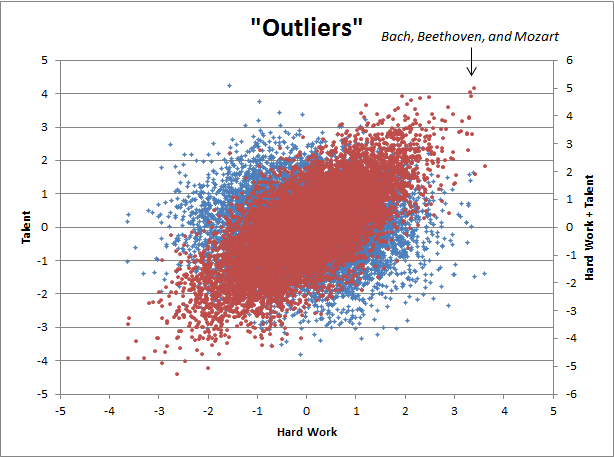 The red dots (right axis) are Hard Work plotted against the sum of Hard Work and Talent—call it “total awesome factor” or “success” or whatever. Now let’s try a little Bayes’ Theorem intuition check: You randomly select a person and they have an awesome factor of +5. What are the odds that they have a work ethic of better than 2 standard deviations above the mean? High? Does this prove that all of the successful people are just hard workers in disguise? Hint: No. And this illustration is conservative: This sample is only 10,000 strong: increase to 10 billion, and the biggest outliers will be even more uniformly even harder workers (and they will all be extremely talented as well). Moreover, this “model” for greatness is just a sum of the two variables, when in reality it is probably closer to a product, which would lead to even greater disparities. E.g. : I imagine total greatness achieved might be something like great stuff produced per minute worked (a function of talent) times total minutes worked (a function of willpower, determination, fortitude, blah blah, etc). The general problem with Gladwell I think is that his emphatic de-emphasis of talent (which has no evidence backing it up) cheapens his much stronger underlying observation that for any individual to fully maximize their potential takes the accumulation of a massive amount of hard work—and this is true for people regardless of what their full potential may be. Of course, this could just be a shrewd marketing ploy on his part: you probably sell more books by selling the hope of greatness rather than the hope of being an upper-level mid-manager (especially since you don’t have to worry about that hope going unfulfilled for at least 10 years). UPDATE: Advanced NFL Stats Admits I Was Right. Sort Of. Background: In January, long before I started blogging in earnest, I made several comments on this Advanced NFL Stats post that were critical of Brian Burke’s playoff prediction model, particularly that, with 8 teams left, it predicted that the Dallas Cowboys had about the same chance of winning the Super Bowl as the Jets, Ravens, Vikings, and Cardinals combined. This seemed both implausible on its face and extremely contrary to contract prices, so I was skeptical. In that thread, Burke claimed that his model was “almost perfectly calibrated. Teams given a 0.60 probability to win do win 60% of the time, teams given a 0.70 probability win 70%, etc.” I expressed interest in seeing his calibration data, ”especially for games with considerable favorites, where I think your model overstates the chances of the better team,” but did not get a response. On the other hand, there appears to be some trends. the home team is over-favored in mismatches where it is the stronger team and is under-favored in mismatches where it is the weaker team. It’s possible that home field advantage may be even stronger in mismatches than the model estimates. Wait, what? 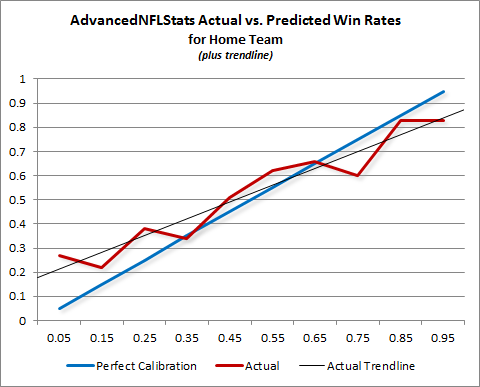 If the error were strictly based on stronger-than-expected home-field advantage, the red line should be above the blue line, as the home team should win more often than the model projects whether it is a favorite or not – in other words, the actual trend-line would be parallel to the “perfect” line but with a higher intercept. Rather, what we see is a trend-line with what appears to be a slightly higher intercept but a somewhat smaller slope, creating an “X” shape, consistent with the model being least accurate for extreme values. In fact, if you shifted the blue line slightly upward to “shock” for Burke’s hypothesized home-field bias, the “X” shape would be even more perfect: the actual and predicted lines would cross even closer to .50, while diverging symmetrically toward the extremes. Considering that this error compounds exponentially in a series of playoff games, this data (combined with the still-applicable issue I discussed previously), strongly vindicates my intuition that the market is more trustworthy than Burke’s playoff prediction model, at least when applied to big favorites and big dogs. A couple of days ago, ESPN’s Peter Keating blogged about “icing the kicker” (i.e., calling timeouts before important kicks, sometimes mere instants before the ball is snapped). He argues that the practice appears to work, at least in overtime. Ultimately, however, he concludes that his sample is too small to be “statistically significant.” This may be one of the few times in history where I actually think a sports analyst underestimates the probative value of a small sample: as I will show, kickers are generally worse in overtime than they are in regulation, and practically all of the difference can be attributed to iced kickers. More importantly, even with the minuscule sample Keating uses, their performance is so bad that it actually is “significant” beyond the 95% level. In Keating’s 10 year data-set, kickers in overtime only made 58.1% of their 35+ yard kicks following an opponent’s timeout, as opposed to 72.7% when no timeout was called. The total sample size is only 75 kicks, 31 of which were iced. 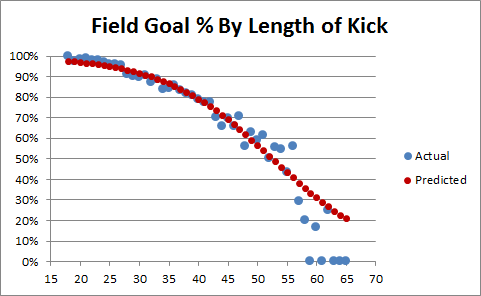 But the key to the analysis is buried in the spreadsheet Keating links to: the average length of attempted field goals by iced kickers in OT was only 41.87 yards, vs. 43.84 yards for kickers at room temperature. Keating mentions this fact in passing, mainly to address the potential objection that perhaps the iced kickers just had harder kicks — but the difference is actually much more significant. Note: These two lines are slightly different from their counterparts above. 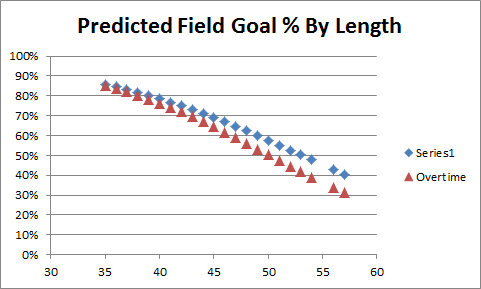 To avoid bias created by smaller or larger values, and to match Keating’s sample, I re-ran the regressions using only 35+ yard distances that had been attempted in overtime (they turned out virtually the same anyway). Note : for people who might not pick: Yes, the predicted conversion rate for the average length is not going to be exactly the same as the average predicted value for the length of each kick. But it is very close, and close enough. 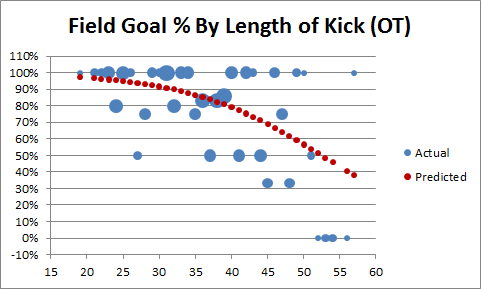 As you can see, the OT kickers who were not iced actually did very slightly better than average, which means that all of the negative bias observed in OT kicking stems from the poor performance seen in just 31 iced kick attempts. The probability of this result occurring by chance — assuming the expected conversion rate for OT iced kicks were equal to the expected conversion rate for kicks overall — would be only 2.4%. Of course, “probability of occurring by chance” is the definition of statistical significance, and since 95% against (i.e., less than 5% chance of happening) is the typical threshold for people to make bold assertions, I think Keating’s statement that this “doesn’t reach the level of improbability we need to call it statistically significant” is unnecessarily humble. 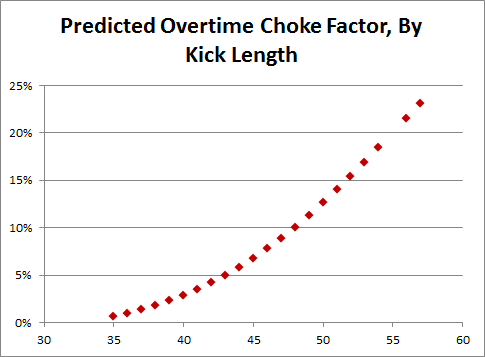 Moreover, when I stated that the key to this analysis was the 2 yard difference that Keating glossed over, that wasn’t for rhetorical flourish: if the length of the average OT iced kick had been the same as the length of the average OT regular kick, the 58.1% would correspond to a “by chance” probability of 7.6%, obviously not making it under the magic number. Last week on PTI, Dan LeBatard mentioned an interesting stat that I had never heard before: that 13 of 14 Hall of Fame coaches had Hall of Fame QB’s play for them. LeBatard’s point was that he thought great quarterbacks make their coaches look like geniuses, and he was none-too-subtle about the implication that coaches get too much credit. My first thought was, of course: Entanglement, anyone? That is to say, why should he conclude that the QB’s are making their coaches look better than they are instead of the other way around? Good QB’s help their teams win, for sure, but winning teams also make their QB’s look good. Thus – at best – LeBatard’s stat doesn’t really imply that HoF Coaches piggyback off of their QB’s success, it implies that the Coach and QB’s successes are highly entangled. By itself, this analysis might be enough material for a tweet, but when I went to look up these 13/14 HoF coach/QB pairs, I found the history to be a little more interesting than I expected. First, I’m still not sure exactly which 14 HoF coaches LeBatard was talking about. According the the official website, there are 21 people in the HoF as coaches. From what I can tell, 6 of these (Curly Lambeau, Ray Flaherty, Earle Neale, Jimmy Conzelman, Guy Chamberlain and Steve Owen) coached before the passing era, so that leaves 15 to work with. A good deal of George Halas’s coaching career was pre-pass as well, but he didn’t quit until 1967 – 5 years later than Paul Brown – and he coached a Hall of Fame QB anyway (Sid Luckman). Of the 15, 14 did indeed coach HoF QB’s, at least technically. Joe Gibbs wins the outlier prize by a mile: not only did he win 3 championships “on his own,” he did it with 3 different non-HoF QB’s. Don Shula had 3 separate eras of greatness, and I think would have been a lock for the hall even with the Griese era excluded. George Allen never won a championship, but he never really had a HoF QB either: Jurgensen (HoF) served as Billy Kilmer (non-HoF)’s backup for the 4 years he played under Allen. Sid Gillman had a long career, his sole AFL championship coming with the Chargers in 1963 – with Tobin Rote (non-HoF) under center. Weeb Ewbank won 2 NFL championships in Baltimore with Johnny Unitas, and of course won the Super Bowl against Baltimore and Unitas with Joe Namath. Finally, George Halas won championships with Pard Pearce (5’5”, non-HoF), Carl Brumbaugh (career passer rating: 34.9, non-HoF), Sid Luckman (HoF) and Billy Wade (non-HoF). Plus, you know, he’s George Halas. Though Chuck Noll won all of his championships with Terry Bradshaw (HoF), those Steel Curtain teams weren’t exactly carried by the QB position (e.g., in the 1974 championship season, Bradshaw averaged less than 100 passing yards per game). Bill Walsh is a bit more borderline: not only did all of his championships come with Joe Montana, but Montana also won a Super Bowl without him. However, considering Walsh’s reputation as an innovator, and especially considering his incredible coaching tree (which has won nearly half of all the Super Bowls since Walsh retired in 1989), I’m willing to give him credit for his own notoriety. Finally, Vince Lombardi, well, you know, he’s Vince Lombardi. I waffled a little on Paul Brown, as he is generally considered an architect of the modern league (and, you know, a team is named after him), but unlike Lombardi, Walsh and Knoll, Brown’s non-Otto-Graham-entangled accomplishments are mostly unrelated to coaching. I’m sure various arguments could be made about individual names (like, “You crazy, Tom Landry is awesome”), but the point of this list isn’t to denigrate these individuals, it’s simply to say that these are the HoF coaches whose coaching successes are the most difficult to isolate from their quarterback’s. I don’t really want to speculate about any broader implications, both because the sample is too small to make generalizations, and because my intuition is that coaches probably do get too much credit for their good fortune (whether QB-related or not). But regardless, I think it’s clear that LeBatard’s 13/14 number is highly misleading. Two nights ago, as I was watching cable news and reading various online articles and blog posts about Christine O’Donnell’s upset win over Michael Castle in Delaware’s Republican Senate primary, the hasty, almost ferocious emergence of consensus among the punditocracy – to wit, that the GOP now has virtually zero chance of picking up that seat in November – reminded me of an issue that I’ve wanted to blog about since long before I began blogging in earnest: NFL playoff prediction models. Specifically, I have been critical of those models that project the likelihood of each surviving team winning the Super Bowl by applying a logistic regression model (i.e., “odds of winning based on past performance”) to each remaining game. In January, I posted a number of comments to this article on Advanced NFL Stats, in which I found it absurd that, with 8 teams left, his model predicted that the Dallas Cowboys had about the same chance of winning the Super Bowl as the Jets, Ravens, Vikings, and Cardinals combined. In the brief discussion, I gave two reasons (in addition to my intuition): first, that these predictions were wildly out of whack with contract prices in sports-betting markets, and second, that I didn’t believe the model sufficiently accounted for “variance in the underlying statistics.” Burke suggested that the first point is explained by a massive epidemic of conjunction-fallacyitis among sports bettors. On its face, I think this is a ridiculous explanation: i.e., does he really believe that the market-movers in sports betting — people who put up hundreds of thousands (if not millions) of dollars of their own money — have never considered multiplying the odds of several games together? Regardless, in this post I will put forth a much better explanation for this disparity than either of us proffered at the time, hopefully mooting that discussion. On my second point, he was more dismissive, though I was being rather opaque (and somehow misspelled “beat” in one reply), so I don’t blame him. However, I do think Burke’s intellectual hubris regarding his model (aka “model hubris”) is notable – not because I have any reason to think Burke is a particularly hubristic individual, but because I think it is indicative of a massive epidemic of model-hubrisitis among sports bloggers. In Section 1 of this post, I will discuss what I personally mean by “applied epistemology” (with apologies to any actual applied epistemologists out there) and what I think some of its more-important implications are. In Section 2, I will try to apply these concepts by taking a more detailed look at my problems with the above-mentioned playoff prediction models. For those who might not know, “epistemology” is essentially a fancy word for the “philosophical study of knowledge,” which mostly involves philosophers trying to define the word “knowledge” and/or trying to figure out what we know (if anything), and/or how we came to know it (if we do). For important background, read my Complete History of Epistemology (abridged), which can be found here: In Plato’s Theaetetus, Socrates suggests that knowledge is something like “justified true belief.” Agreement ensues. In 1963, Edmund Gettier suggests that a person could be justified in believing something, but it could be true for the wrong reasons. Debate ensues. The End. Imagine yourself in the following scenario: From childhood, you have one burning desire: to know the answer to Question X. This desire is so powerful that you dedicate your entire life to its pursuit. You work hard in school, where you excel greatly, and you master every relevant academic discipline, becoming a tenured professor at some random elite University, earning multiple doctorates in the process. You relentlessly refine and hone your (obviously considerable) reasoning skills using every method you can think of, and you gather and analyze every single piece of empirical data relevant to Question X available to man. Finally, after decades of exhaustive research and study, you have a rapid series of breakthroughs that lead you to conclude – not arbitrarily, but completely based on the proof you developed through incredible amounts of hard work and ingenuity — that the answer to Question X is definitely, 100%, without a doubt: 42. Congratulations! To celebrate the conclusion of this momentous undertaking, you decide to finally get out of the lab/house/library and go celebrate, so you head to a popular off-campus bar. You are so overjoyed about your accomplishment that you decide to buy everyone a round of drinks, only to find that some random guy — let’s call him Neb – just bought everyone a round of drinks himself. What a joyous occasion: two middle-aged individuals out on the town, with reason to celebrate (and you can probably see where this is going, but I’ll go there anyway)! As you quickly learn, it turns out that Neb is around your same age, and is also a professor at a similarly elite University in the region. In fact, it’s amazing how much you two have in common: you have relatively similar demographic histories, identical IQ, SAT, and GRE scores, you both won multiple academic awards at every level, you have both achieved similar levels of prominence in your academic community, and you have both been repeatedly published in journals of comparable prestige. In fact, as it turns out, you have both been spent your entire lives studying the same question! You have both read all the same books, you have both met, talked or worked with many comparably intelligent — or even identical — people: It is amazing that you have never met! Neb, of course, is feeling so celebratory because finally, after decades of exhaustive research and study, he has just had a rapid series of breakthroughs that lead him to finally conclude – not arbitrarily, but completely based on the proof he developed through incredible amounts of hard work and ingenuity — that the answer to Question X is definitely, 100%, without a doubt: 54. You spend the next several hours drinking and arguing about Question X: while Neb seemed intelligent enough at first, everything he says about X seems completely off base, and even though you make several excellent points, he never seems to understand them. He argues from the wrong premises in some areas, and draws the wrong conclusions in others. He massively overvalues many factors that you are certain are not very important, and is dismissive of many factors that you are certain are crucial. His arguments, though often similar in structure to your own, are extremely unpersuasive and don’t seem to make any sense, and though you try to explain yourself to him, he stubbornly refuses to comprehend your superior reasoning. The next day, you stumble into class, where your students — who had been buzzing about your breakthrough all morning — begin pestering you with questions about Question X and 42. In your last class, you had estimated that the chances of 42 being “the answer” were around 90%, and obviously they want to know if you have finally proved 42 for certain, and if not, how likely you believe it is now. What do you tell them? All of the research and analysis you conducted since your previous class had, indeed, led you to believe that 42 is a mortal lock. In the course of your research, everything you have thought about or observed or uncovered, as well as all of the empirical evidence you have examined or thought experiments you have considered, all lead you to believe that 42 is the answer. As you hesitate, your students wonder why, even going so far as to ask, “Have you heard any remotely persuasive arguments against 42 that we should be considering?” Can you, in good conscience, say that you know the answer to Question X? For that matter, can you even say that the odds of 42 are significantly greater than 50%? You may be inclined, as many have been, to “damn the torpedoes” and act as if Neb’s existence is irrelevant. But that view is quickly rebutted: Say one of your most enterprising students brings a special device to class: when she presses the red button marked “detonate,” if the answer to Question X is actually 42, the machine will immediately dispense $20 bills for everyone in the room; but if the answer is not actually 42, it will turn your city into rubble. And then it will search the rubble, gather any surviving puppies or kittens, and blend them. So assuming you’re on board that your chance encounter with Professor Neb implies that, um, you might be wrong about 42, what comes next? There’s a whole interesting line of inquiry about what the new likelihood of 42 is and whether anything higher than 50% is supportable, but that’s not especially relevant to this discussion. But how about this: Say the scenario proceeds as above, you dedicate your life, yadda yadda, come to be 100% convinced of 42, but instead of going out to a bar, you decide to relax with a bubble bath and a glass of Pinot, while Neb drinks alone. You walk into class the next day, and proudly announce that the new odds of 42 are 100%. Mary Kate pulls out her special money-dispensing device, and you say sure, it’s a lock, press the button. Yay, it’s raining Andrew Jacksons in your classroom! And then: **Boom** **Meow** **Woof** **Whirrrrrrrrrrrrrr**. Apparently Mary Kate had a twin sister — she was in Neb’s class. In reality, the fact that you might be wrong, even when you’re so sure you’re right, is more than a philosophical curiosity, it is a mathematical certainty. The processes that lead you to form beliefs, even extremely strong ones, are imperfect. And when you are 100% certain that a belief-generating process is reliable, the process that led you to that belief is likely imperfect. This line of thinking is sometimes referred to as skepticism — which would be fine if it weren’t usually meant as a pejorative. When push comes to shove, people will usually admit that there is at least some chance they are wrong, yet they massively underestimate just what those chances are. In political debates, for example, people may admit that there is some miniscule possibility that their position is ill-informed or empirically unsound, but they will almost never say that they are more likely to be wrong than to be right. Yet, when two populations hold diametrically opposed views, either one population is wrong or both are – all else being equal, the correct assessment in such scenarios is that no-one is likely to have it right. When dealing with beliefs about probabilities, the complications get even trickier: Obviously many people believe some things are close to 100% likely to be true, when the real probability may be some-much if not much-much lower. But in addition to the extremes, people hold a whole range of poorly-calibrated probabilistic beliefs, like believing something is 60% likely when it is actually 50% or 70%. (Note: Some Philosophically trained readers may balk at this idea, suggesting that determinism entails everything having either a 0 or 100% probability of being true. While this argument may be sound in classroom discussions, it is highly unpragmatic: If I believe that I will win a coin flip 60% of the time, it may be theoretically true that the universe has already determined whether the coin will turn up heads or tails, but for all intents and purposes, I am only wrong by 10%). But knowing that we are wrong so much of the time doesn’t tell us much by itself: it’s very hard to be right, and we do the best we can. We develop heuristics that tend towards the right answers, or — more importantly for my purposes — that allow the consequences of being wrong in both directions even out over time. You may reasonably believe that the probability of something is 30%, when, in reality, the probability is either 20% or 40%. If the two possibilities are equally likely, then your 30% belief may be functionally equivalent under many circumstances, but they are not the same, as I will demonstrate in Section 2 (note to the philosophers: you may have noticed that this is a bit like the Gettier examples: you might be “right,” but for the wrong reasons). There is a science to being wrong, and it doesn’t mean you have to mope in your study, or act in bad faith when you’re out of it. “Applied Epistemology” (at least as this armchair philosopher defines it) is the study of the processes that lead to knowledge and beliefs, and of the practical implications of their limitations. Burke states that the individual game prediction model has a “history of accuracy” and is well “calibrated,” meaning that, historically, of the teams it has predicted to win 30% of the time, close to 30% of them have won, and so on. For a number of reasons, I remain somewhat skeptical of this claim, especially when it comes to “extreme value” games where the model predicts very heavy favorites or underdogs. (E.g’s: What validation safeguards do they deploy to avoid over-fitting? How did they account for the thinness of data available for extreme values in their calibration method?) But for now, let’s assume this claim is correct, and that the model is calibrated perfectly: The fact that teams predicted to win 30% of the time actually won 30% of the time does NOT mean that each team actually had a 30% chance of winning. That 30% number is just an average. If you believe that the model perfectly nails the actual expectation for every team, you are crazy. Since there is a large and reasonably measurable amount of variance in the very small sample of underlying statistics that the predictive model relies on, it necessarily follows that many teams will have significantly under or over-performed statistically relative to their true strength, which will be reflected in the model’s predictions. The “perfect calibration” of the model only means that the error is well-hidden. This doesn’t mean that it’s a bad model: like any heuristic, the model may be completely adequate for its intended context. For example, if you’re going to bet on an individual game, barring any other information, the average of a team’s potential chances should be functionally equivalent to their actual chances. But if you’re planning to bet on the end-result of a series of games — such as in the divisional round of the NFL playoffs — failing to understand the distribution of error could be very costly. For Minnesota, I created a pool of 11 possible expectations that includes the actual prediction plus teams that were 5% to 25% better or worse. I did the same for Arizona, but with half the deviation. The average win prediction for each game remains constant, but the overall chances of winning the Super Bowl change dramatically. To some of you, the difference between 2% and 1% may not seem like much, but if you could find a casino that would regularly offer you 100-1 on something that is actually a 50-1 shot, you could become very rich very quickly. Of course, this uniform distribution is a crude one of many conceivable ways that the “hidden error” could be distributed, and I have no particular reason to think it is more accurate than any other. 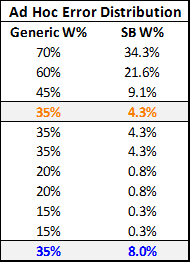 But one thing should be abundantly clear: the winrate model on which this whole system rests tells us nothing about this distribution either. 1. Lower predicted game odds lead to greater disparity between predicted and actual chances. 2. Greater error ranges in the underlying distribution lead to greater disparity between predicted and actual chances. Of course these underlying error distributions can and should be examined further, but even at this early stage of inquiry, we “know” enough (at least with a high degree of probability) to begin drawing conclusions. I.e., We know there is considerable variance in the statistics that Burke’s model relies on, which strongly suggests that there is a considerable amount of “hidden error” in its predictions. 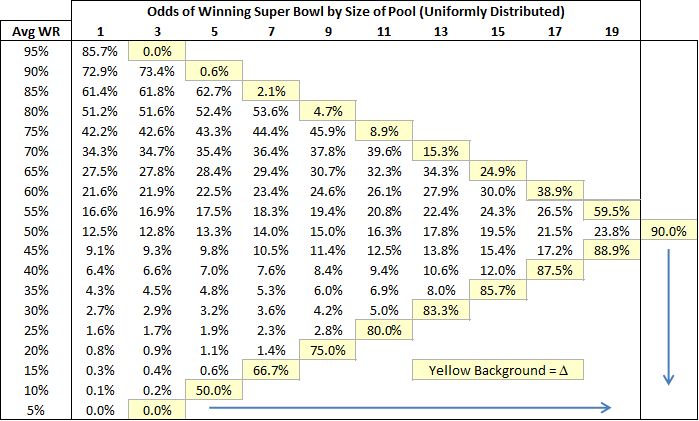 We know greater “hidden error” leads to greater disparity in predicted Super Bowl winning chances, and that this disparity is greatest for underdogs. Therefore, it is highly likely that this model significantly under-represents the chances of underdog teams at the divisional stage of the playoffs going on to win the Superbowl. Q.E.D. This doesn’t mean that these problems aren’t fixable: the nature of the error distribution of the individual game-predicting model could be investigated and modeled itself, and the results could be used to adjust Burke’s playoff predictions accordingly. Alternatively, if you want to avoid the sticky business of characterizing all that hidden error, a Super-Bowl prediction model could be built that deals with that problem heuristically: say, by running a logistical regression that uses the available data to predict each team’s chances of winning the Super Bowl directly. Finally, I believe this evidence both directly and indirectly supports my intuition that the large disparity between Burke’s predictions and the corresponding contract prices was more likely to be the result of model error than market error. The direct support should be obvious, but the indirect support is also interesting: Though markets can get it wrong just as much or more than any other process, I think that people who “put their money where their mouth is” (especially those with the most influence on the markets) tend to be more reliably skeptical and less dogmatic about making their investments than bloggers, analysts or even academics are about publishing their opinions. Moreover, by its nature, the market takes a much more pluralistic approach to addressing controversies than do most individuals. While this may leave it susceptible to being marginally outperformed (on balance) by more directly focused individual models or persons, I think it will also be more likely to avoid pitfalls like the one above. The general purpose of post is to demonstrate both the importance and difficulty of understanding and characterizing the ways in which our beliefs – and the processes we use to form them — can get it wrong. This is, at its heart, a delicate but extremely pragmatic endeavor. It involves being appropriately skeptical of various conclusions — even when they seem right to you – and recognizing the implications of the multitude of ways that such error can manifest. I have a whole slew of ideas about how to apply these principles when evaluating the various pronouncements made by the political commentariat, but the blogosphere already has a Nate Silver (and Mr. Silver is smarter than me anyway), so I’ll leave that for you to consider as you see fit. While Brian’s anecdote about Billy Madison humorously skewers Football Outsiders, it’s not entirely fair, and I think these numbers don’t prove as much as they may appear to at first glance. Sure, a number of conventional or unconventional conclusions people have reached are probably false, but the vast majority of sports wisdom is based on valid causal inferences with at least a grain of truth. The problem is that people have a tendency to over-rely on the various causes and effects that they observe directly, conversely underestimating the causes they cannot see. “Random causes” are not necessarily truly random, but do not bias your conclusions in any particular direction. It is the truly random combined with the may-as-well-be-random, and generates the inherent variance of the system. “Counter causes” are those which you may not see, but which relate to your variables in ways that counteract your inferences. The salary cap in the NFL is one of the most ubiquitous offenders: E.g. an analyst sees a very good quarterback, and for various reasons believes that QB with a particular skill-set is worth an extra 2 wins per season. That QB is obtained by an 8-8 team in free agency, so the analyst predicts that team will win 10 games. But in reality, the team that signed that quarterback had to pay handsomely for that +2 addition, and may have had to cut 2 wins worth of players to do it. If you imagine this process repeating itself over time, you will see that the correlation between QB’s with those skills and their team’s actual winrate may be small or non-existent (in reality, of course, the best quarterbacks are probably underpaid relative to their value, so this is not a problem). In closed systems like sports, these sorts of scenarios crop up all the time, and thus it is not uncommon for a perfectly valid and logical-seeming inference to be, systematically, dead wrong (by which I mean that it not only leads to an erroneous conclusion in a particular situation, but will lead to bad predictions routinely). So how does this relate to Football Outsiders, and how does it amount to a defense of their predictions? First, I think the suggestion that FO may have created “negative knowledge” is demonstrably false: The key here is not to be fooled by the stat that they could barely beat the “coma patient” prediction of 8-8 across the board. 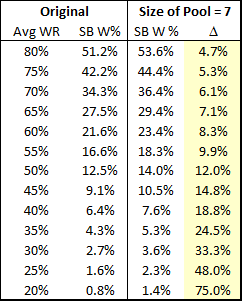 8 wins is the most likely outcome for any team ex ante, and every win above or below that number is less and less likely. E.g., if every outcome were the result of a flip of a coin, your best strategy would be to pick 8-8 for every team, and picking *any* team to go 10-6 or 12-4 would be terrible. Yet Football Outsiders (and others) — based on their expertise — pick many teams to have very good and very bad records. The fact that they break even against the coma patient shows that their expertise is worth something. Second, I think there’s no shame in being unable to beat a simple regression based on one extremely probative variable: I’ve worked on a lot of predictive models, from linear regressions to neural networks, and beating a simple regression can be a lot of work for marginal gain (which, combined with the rake, is the main reason that sports-betting markets can be so tough). Yet, getting beaten so badly by a simple regression is a definite indicator of systematic error — particularly since there is nothing preventing Football Outsiders from using a simple regression to help them make their predictions. Now, I suspect that FO is underestimating football variance, especially the extent of regression to the mean. But this is a blanket assumption that I would happily apply to just about any sports analyst — quantitative or not — and is not really of interest. However, per the distinction I made above, I believe FO is likely underestimating the “counter causes” that may temper the robustness of their inferences without necessarily invalidating them entirely. A relatively minor bias in this regard could easily lead to a significant drop in overall predictive performance, for the same reason as above: the best and worst records are by far the least likely to occur. Thus, *ever* predicting them, and expecting to gain accuracy in the process, requires an enormous amount of confidence. If Football Outsiders has that degree of confidence, I would wager that it is misplaced. Tom Haberstroh, credited as a “Special to ESPN Insider” in his byline, writes this 16 paragraph article, about how “Carmelo Anthony is not an elite player.” Haberstroh boldly — if not effectively — argues that Carmelo’s high shot volume and correspondingly pedestrian Player Efficiency Rating suggests that not only is ‘Melo not quite the superstar his high scoring average makes him out to be, but that he is not even worth the max contract he will almost certainly get next summer. Haberstroh further argues that this case is, in fact, a perfect example of why people should stop paying as much attention to Points Per Game and start focusing instead on PER’s. Anthony may or may not be overrated, and many of Haberstroh’s criticisms on this front are valid — e.g., ‘Melo does have a relatively low shooting percentage — but his evidence is ultimately inconclusive. One piece of statistical evidence that cuts against Haberstroh’s argument is that Carmelo has a very solid win/loss +/- with the Nuggets over his career. With Melo in the lineup, Denver has won 59.9% of their games (308-206), and without him in the lineup over that period, they have won 50% (30-30). While 10% may not sound like much, it is actually elite and compares favorably to the win/loss +/- of many excellent players, such as Chris Bosh (9.1%, and one of the top PER players in the league) and Kobe Bryant (4.1%). All of these numbers should be treated with appropriate skepticism due to the small sample sizes, but they do trend accurately. But the main point I would like to make is that — exactly opposite Haberstrom — I believe Carmelo Anthony is, in fact, a good example of why people should be *more* skeptical of PER’s as the ultimate arbiter of player value. One of the main problems with PER is that it attempts to account for whether a shot’s outcome is good or bad relative to the average shot, but it doesn’t account for whether the outcome is good or bad relative to the average shot taken in context. The types of shots a player is asked to take vary both dramatically and systematically, and can thus massively bias his PER. Many “bad” shots, for example, are taken out of necessity: when the clock is winding down and everyone is defended, someone has to chuck it up. In that situation, “bad” shooting numbers may actually be good, if they are better than what a typical player would have done. If the various types of shots were distributed equally, this would all average out in the end, and would only be relevant as a matter of precision. But in reality, certain players are asked to take the bad shot more often that others, and those players are easy enough to find: they tend to be the best players on their teams. This doesn’t mean I think PER is useless, or irreparably broken. Among other things, I think it could be greatly improved by incorporating shot-clock data as a proxy to model the expected value of each shot (which I hope to write more about in the future). However, in its current form it is far from being the robust and definitive metric that many basketball analysts seem to believe. Points Per Game may be an even more useless metric — theoretically — but at least it’s honest.